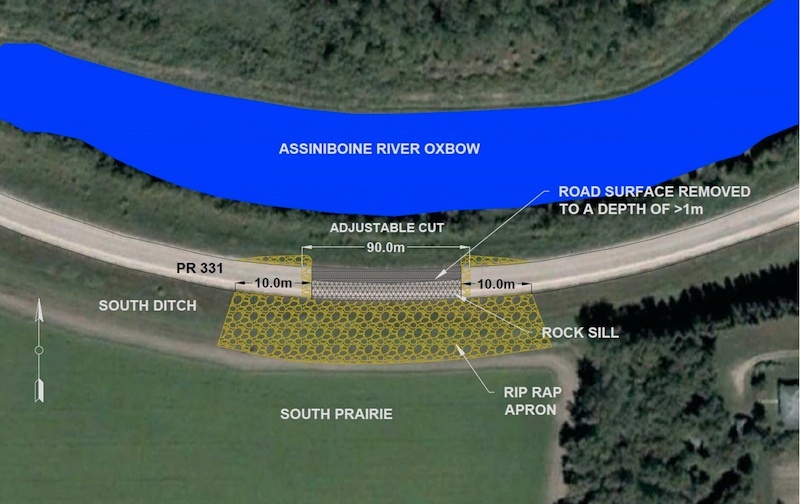 A deliberate breach of a dike holding back water from the swollen Assiniboine River southeast of Portage la Prairie was made early Saturday morning. The controlled release at the Hoop and Holler Bend on Highway 331 was made at about 7 a.m., with water beginning to flow through the cut at a rate of 500 cubic feet per second (cfs) by just after 8 a.m.
“Residents in the immediate area have already been evacuated and significant efforts have been put in place to set up flood-protection systems around affected homes,” the province said in a statement. The release will impact about 225 square kilometres of land, with water eventually ending up in the La Salle River. Flows in the Portage Diversion will decrease as more water is pushed through the cut over the coming days. Officials said the cut was necessary to save about 850 homes that would have been put at risk should an uncontrolled breach occurred at another point along the dike. On Friday, the Canadian Navy began assisting the military with flood preparations in the area — mostly with building up tube dikes and helping residents in the path of the Assiniboine River sandbag. “The Manitoba government is developing a special program to provide comprehensive compensation for homeowners and producers affected by the controlled spill,” a second part of a statement released by officials read. In a live television address to Manitobans Friday night, Premier Greg Selinger called the flooding on the Asisniboine “unprecedented,” and vowed to compensate homeowners and farmers affected by the deliberate breach.